Fire decomposes or breaks down materials. The composition of these breakdown products will vary depending on the composition of the burning materials — this can be from many sources; the ventilation conditions – poor ventilation reduces the available oxygen and changes the makeup of the decomposition products; and the temperature of the fire. Burning produces particles as well as gases & vapours. The gases can often include irritants like hydrogen chloride and acrolein. Only SCBA (self contained breathing apparatus) is suitable for all of the possible contaminants that can be released by fires in all situations. Metropolitan fire fighters use SCBA routinely because the contaminants and their concentrations are unknown in most of their applications. However, SCBA is normally considered unsuitable for bushfire fighting because the air in the cylinders does not last long enough to effectively fight bushfires; the heavy SCBA is used in high temperatures for long periods at high work rates; outfitting and training volunteers with SCBA is too costly and difficult to organise; and maintenance – supplying hundreds or thousands of air cylinders to fire zones would be a logistics nightmare. – Are people to be protected from the occurrence of potentially lethal atmospheres e.g. very high levels of carbon monoxide or oxygen deficient conditions? If so, only SCBA should be used. – If the aim is protection from inhaled particulate contaminants only, use of a P2 rated filter is recommended for the thermally generated particles (AS/NZS1715). This includes disposable types that are light and comfortable like the 3MTM Disposable respirators 9320, 9320A+ and 9322A+, P2. If comfort and reduction of irritation is the primary concern, a variety of air filtering respirators is available – in both disposable and reusable styles. Each type has advantages and disadvantages in specific applications, for example when the fire produces low levels of organic vapours and/or irritant acid gases. 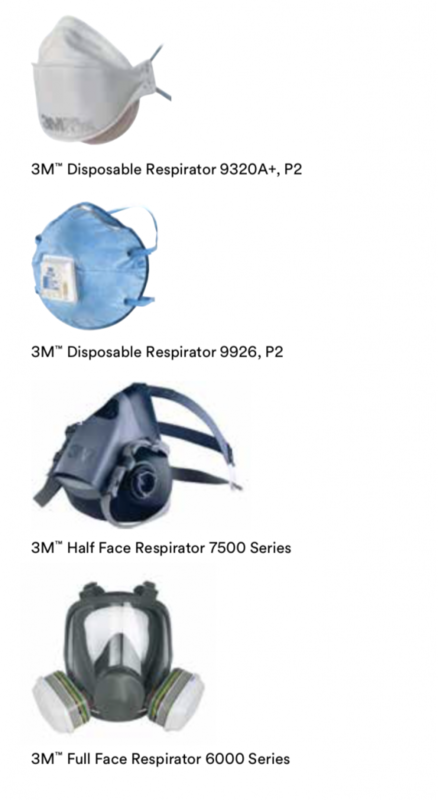 Disposable masks for low gas or vapour concentrations help reduce irritation and respirators like the 3M disposable respirators 8514, P2 and 9926, P2 have been used for bushfire fighting. By capturing the smoke particles and some of the off gases, irritation from smoke inhalation can be significantly reduced. Another option is to use a half facemask like the 3M 6000 or 7500 series fitted with 2000 series or 6035/6038 filters. The 2125 is a P2 rated filter suitable for smokes and fumes, while the 2128 GP2 is the same particle filter with an added layer of carbon to help absorb nuisance levels of organic vapours and acid gases. Using a 3MTM 6800 full face mask with the 2135 (P3) or 2138 (GP3 with added carbon) will provide even higher levels of respiratory and also eye protection. The 6035 (P3) and 6038 (P3 with nuisance level acid gas/organic vapour capacity) provide an enclosed filter for greater protection and durability. – Is rated gas or vapour and particle protection required eg for formaldehyde? If concentrations of gas or vapours are significant, AS/NZS1716 rated gas or vapour filters should be used fitted to a half face mask like the 3M 6000 or 7500 series, for example the 3M 6075 formaldehyde or organic vapour filter with the 5925, P2 particle filter. If concentrations are very high (not routine in a bushfire scenario), then SCBA is an option or a full face mask (6000 or 7800 series) fitted with organic vapour or formaldehyde or particle capability (6075/5925 filter combination). Respirators that are easy to use and maintain will also help gain user acceptance. This is because lightweight respirators are more comfortable; exhalation valves help prevent heat build-up. They let the warm, moisture-laden breath escape quickly from inside the mask; and maintenance free or disposable products reduce the risk of using defective equipment. There is no spare parts inventory and no time resource required for maintenance.